With the assistance of the Jakarta Legal Aid Institute (LBH Jakarta), Filep Karma, a former Papuan political prisoner, lobbied the Ministry of Law and Human Rights to grant him a rare permit to visit the Nusa Kambangan island’s prisons. Karma received the permit on Jan. 20, 2016 and invited me to accompany him, visiting the forgotten political prisoners. Johan Teterisa went from school teacher to political prisoner on June 29, 2007. On that day, he led a group of 27 Moluccan independence activists to join in the annual Family Day festivities at Merdeka Stadium in Ambon, the capital of Maluku province. The activists scandalized then-President Susilo Bambang Yudhoyono, who was in the audience with a group of foreign diplomats, by performing the Moluccan cakalele traditional war dance and unfurling the officially banned Republic of South Maluku (RMS) flag. Johan and his fellow dancers were part of a long-simmering independence movement that has existed in the southern Moluccas since 1950, the year after Indonesia gained its independence internationally. That year, a group of Moluccan nationalists proclaimed the creation of the RMS in defiance of the Indonesian government’s claim to the region. Ever since, Moluccan activists who advocate pro-independence views have risked arrest, prolonged detention and torture by Indonesian security forces. Today, Johan and other Moluccan political prisoners are locked up far from their families and largely forgotten. I had a rare visit with them recently and found them in ailing health. The government needs to act to set them free. Within days of the stadium stunt, police arrested Johan and 75 other activists. Police tortured many of them and within months an Ambon court had convicted 66 including Johan, for “treason,” and sentenced them to prison terms of seven to 20 years. The convictions were under articles 106 and 110 of the Indonesian Criminal Code, which effectively criminalize freedom of expression. In July 2007, Yudhoyono issued a presidential decree that criminalized the public display of pro-independence symbols. In Indonesia today, displaying flags or logos with the same features as “separatist movements” can still reap multi-decade prison terms. Johan is one of 28 Moluccan political prisoners arrested in connection with the June 2007 protest and other Moluccan flag-raising events still behind bars. 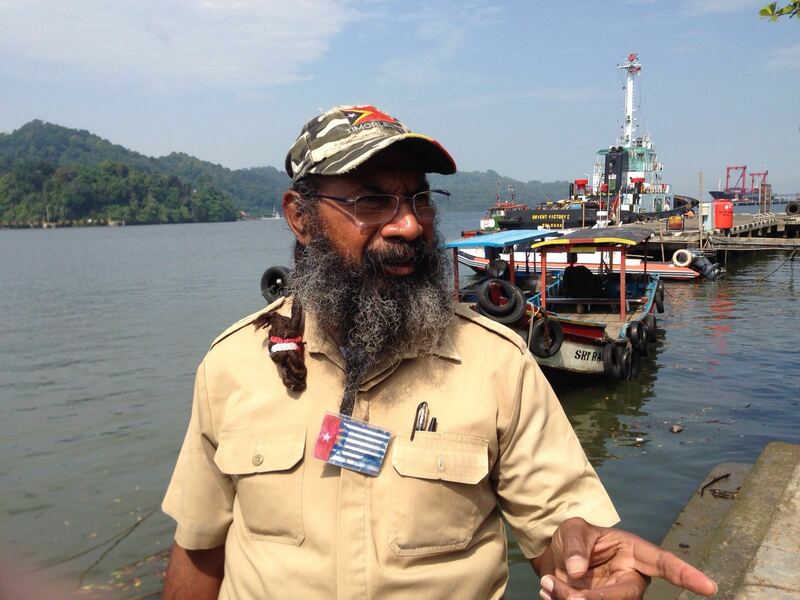 He says they are Indonesia’s “forgotten political prisoners” because their plight has been overshadowed by a government focus on the political prisoners in Papua and West Papua. President Joko Widodo, better known as Jokowi, granted clemency last May to five Papuan political prisoners and released the high-profile Papuan political prisoner Filep Karma in November by a sentence remission. The government has not explored any such release strategy for the Moluccans. On Jan. 21, I visited Johan and six other Moluccan political prisoners on Indonesia’s forbidding prison island of Nusa Kambangan. That visit was the result of a special one-day permit that I Wayan Dusak, the director general for prisons at the Ministry of Law and Human Rights, issued to Filep. With the assistance of the Jakarta Legal Aid Institute (LBH Jakarta), Filep had lobbied the ministry to grant him a rare permit to visit the island’s prisons. Filep received the permit on Jan. 20 and invited me to accompany him. The visit was sobering. Johan and the six other Moluccan political prisoners, who are detained in two prisons on the island, suffer not only from official neglect, but from isolation. Nusa Kambangan is 3,000 kilometers from Ambon, which severely handicaps the Moluccan prisoners’ ability to stay in close touch with their friends and family members. Since their 2009 transfer to Nusa Kambangan, none of the Moluccan prisoners have had any visits from friends and family. The others are Ruben Saija, Yohanis Saija, Jordan Saija, Abner Litamahuputty, Romanus Batseran and John Marcus. Their families cannot afford to fly to Java from Ambon, and reaching Nusa Kambangan over land and by boat poses near-insurmountable challenges. Isolation has taken a profound emotional and psychological toll on the men there. Ruben Saija, serving a 20-year sentence for his June 2007 protest dance, told me that that he tried to commit suicide by drinking pesticide on the day of his 9-year-old daughter’s baptism back on Haruku Island, near Ambon, in December 2015. The political prisoners on Nusa Kambangan have refused to apply for a presidential pardon, claiming that it would imply an admission of guilt. They would accept amnesties or an abolition of their prison sentences. However, the Indonesian House of Representatives, which has the power to approve such measures, has yet to respond to Jokowi’s proposal last May to release all political prisoners in Indonesia. Time may be running out for these men. A combination of the effects of torture, poor living conditions, and inadequate medical care has seriously harmed their health. Johan, who is 55, suffers from painful and debilitating arteriosclerosis. Ruben is now a gaunt 32-year-old whose chronic kidney problems frequently make him urinate blood. He told me that he lacked the money to purchase medication to treat his illness.Batseran is similarly gaunt, the result of a bout of tuberculosis after he arrived on Nusa Kambangan. Government action is needed now. Jokowi’s law and human rights minister, Yasonna Laoly, and Dusak, his prison director general, should take the initiative to accelerate the release of these forgotten political prisoners through amnesty, clemency or sentence reductions. In the meantime, the government should immediately approve a transfer of Moluccan prisoners from Nusa Kambangan back to Ambon, closer to their families. Most importantly, the Jokowi government should abolish the 2007 presidential decree that criminalizes the display of pro-independence symbols. As long as that decree remains on the books, Indonesians are at risk of lengthy imprisonment for doing nothing more than peacefully exercising their right to freedom of expression. Andreas Harsono is Indonesia researcher at Human Rights Watch. He has researched and written about political prisoners in eastern Indonesia since 2003.